Kalonji, Kalijeera or Black Seed Oil is a Remedy for Every Disease but Death. Nigella Sativa is a spice that originates from Western Asia and grows about 16-24 inches tall with white flowers when in bloom. Originally, the seed comes from Egypt but Nigella Sativa or Black Seed can be cultivated in many countries; this includes Ethiopia, European countries such as France, Russia and Germany as well as in the Mediterranean Basin (i.e. Turkey, Italy, Egypt, etc.) and parts of the Middle East like Oman, not to mention India, Bangladesh and countries in the Far East. The seed is often referred to as Black Cumin Seed in the Western World, which in turn can sometimes be referring to Bunium Persicum. This raises the issue of the importance of double checking with the botanical name of unfamiliar herbs and spices before buying. The Nigella Sativa has other names that, depending on the place of purchase, can include: Black Seed, devil-in-a-bush, love in a mist, Kalonji, Black Caraway, Roman Coriander, Fennel Flower, Upakuncika, Karavi. The spice was mentioned in the Bible and by Prophet Mohammed (PBUH) and was also used in Unani-tibb, (sometimes spelled Yunani-tibb – Arabic for Greek Medicine), Ayurvedic and Chinese healers. Hippocrates used it for digestive and metabolic disorders. Arab physician Avicenna (Latinate form of the Arabic ibn Sīnā) called it, “Canon of medicine.” It has also been said that Cleopatra used it in her beauty regime and that Queen Nefertiti used to bring luster to her hair and nails and archeologists even found Black Seed Oil in King Tutankhamun’s tomb. There are over 621 articles and research papers on Nigella Sativa in PubMed, confirming what the Middle Eastern and North African population have known for thousands of years. Since 1959 over 200 studies have been carried out at international universities and articles published showing remarkable results supporting its benefits. 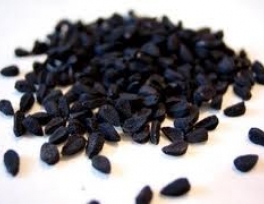 Many people on the web refer to Black Seed or Kalonji as Black Cumin Seed. This can sometimes bring about confusion as in some cases, both refer to the same thing, whereas in other the latter refers to Banium Persicum. Black Cumin Seed (or Shah Jeera) is often more correctly describing another aromatic spice that is popularly used in Asian cuisine. The two look and smell different as well. It contains 35% oil, 21% protein and 38% carbohydrate. A, B1, B2, B3 and Vitamin C.
Calcium, potassium, iron, zinc, magnesium, sodium & selenium. Linolenic, oleic-acid, palmitic-acid. Also contains numerous structurally unusual unsaturated fatty acids. Contains 15 amino acids including, phenylalanine, arginine, tryptophan, and tyrosine. Phytosterols (Beta sitosterol), stearic-acid, stigmasterol, tannin, thymoquinone (TQ). Monosaccharides, polysaccharides, glucose, xylose, rhamnose, and arabinose. Crystalline nigellone, thymoquinone and others. Black Seed can be used for in a multitude of ways such as: analgesic, anti-bacterial, antibiotic, anti-bronchial, anti-carcinogenic, anti-cholinergic, anti-fungal, anti-histaminic, anti-inflammatory, antioxidant, antitumor, antispasmodic, anti-viral, carminative, detoxicant, diaphoretic, digestive, diuretic, emmenagogue, galactagogue, hypoglycemic, hypotensive, immune-stimulant, lithagogue, liver protective, kidney protective, stimulate-energy, vasodilator, among many. How Can I Take Black Seed Oil? Cold pressed black seed oil should be kept in the fridge. You can take 1-2 teaspoons a day. A teaspoon of black seed oil can be added to your coffee or yogurt. Lightly warm the oil and rub the oil on your chest for respiratory conditions or, apply gently on rheumatic areas. Use as a vapor by adding a teaspoon of black seed oil in a hot water bowl and inhale the pungent vapour. Apply black seed oil on your hair to prevent premature greying and hair loss. My mother loves to make a paste by grinding it and eating it with her rice. She firmly believes that Kalojeera/Kalonji or Black Seed will strengthen her immune system. My father and my sister take a teaspoon of the cold pressed Black Seed Oil every day. The following are the conditions for which Black Seed Oil can be used for fast healing. Skin Healing: Black seed oil has been used to treat psoriasis, eczema, acne, skin infections, and fungal infections. Black seed oil has the ability to deal with abnormal cell proliferation. It also has emollient properties that provided nutrients for the skin. The anti-fungal property in Black seed oil fights against infectious organisms and provides assistance for nail infections, athlete’s foot, and ringworm. Boils: Studies show that ingesting Black Seed Oil twice daily (even in beverages), in half a teaspoon doses allows the active component, thymoquinone to help fortify the immune system. Its anti-fungal properties also fight against dermal infections like boils and carbuncles. Toothaches: Toothaches are said to be soothed by Nigella Sativa’s anti-bacterial and anti-inflammatory properties. Respiratory Conditions: Black seed oil is a popular remedy for asthma, the common cold, the flu, bronchitis, coughs and fevers. Application of Black Seed Oil to the chest and back or taking a teaspoon daily can reduce the effects these conditions. Allergies: It reduces allergy symptoms as well as histamine induced spasms. Recovery from Fatigue: Black seed oil stimulates the body’s energy production and relieves it from fatigue and exhaustion. Kidney Support: Black seed reduces kidney stone size when it is ground, blended with honey, and taken with warm water. Pain Relief: As a useful analgesic black seed reduces headaches and toothaches. Nails & Hair: Direct application and ingestion of black seed oil strengthens hair and nails. To treat baldness, apply the oil in the affected area. Diabetes: 2 grams of this spice, taken daily, can reduce one’s fasting blood sugar levels as well as decrease insulin resistance. Heart Problems Regarding Vein Constriction: A half a teaspoon of Black Seed Oil can be mixed with any hot drink in the morning can liquefy the fats that clog the veins as well as widen both major blood vessels: veins and arteries. Parkinson’s disease and Dementia: Research has shown that an extract of thymoquinone, an active component in Nigella Sativa, showed to be able to help in protecting the brain from levels of toxicity that damage the neurons in ways that are related to both Parkinson’s disease and dementia. I love the Black Seed Oil by ‘Amazing Herbs.’ It is cold pressed, solvent-free and alcohol-free.